A very common problem that can occur while a patient has braces is the formation of white spots during treatment. When the braces are removed, some patients will have unsightly white spots and they wonder why they are there. Some patients are surprised and they shouldn’t be. Your orthodontist watches and warns when white spots are forming. 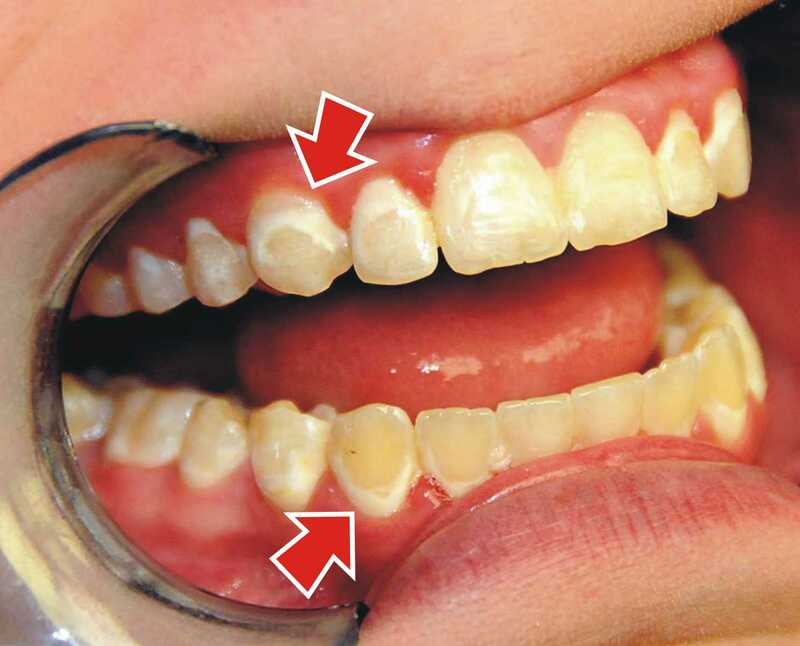 The white spots are the decalcified areas of the teeth where plaque was allowed to stay for long periods of time. You will hear your orthodontist say over and over again to keep your teeth clean, brush and floss. How did the white spots develop? There are many types of bacteria that live in our mouth. They show up after you were born and stay with you your whole life. You can’t get rid of them completely. You can only reduce the amount of bacteria in your mouth. We reduce the bacteria by brushing, flossing and rinsing with mouthwash that kills bacteria. The bacteria streptococcus mutans and lactobacillus are the main germs in dental plaque. Dental plaque is sticky and likes to attach to smooth surfaces of the tooth. These bacteria eat sugars that you eat everyday. When you eat your food, it will contain sugar that the bacteria eats. After the bacteria ingests the sugar, they produce more of themselves and they give off acid for 20 minutes. Since, the plaque is right up against your teeth, the acid dissolves the enamel causing a white decalcification spot to form and eventually it will cause a cavity. A cavity is just a hole in your tooth. These white spots are the beginnings of a cavity. Since the outside layer of the enamel is very hard due to it being enriched with fluoride from our tooth paste, food and water, the decalcification starts below this layer deeper in the enamel. When you look at the surface of the tooth, the outside layer is intact but you can see the white decalcification spot. Once the decalcification weakens the outside layer of enamel enough, it will break through resulting in a hole in the tooth, a cavity. Once the cavity forms, it will not go away. The bacteria will lay in it and continue the decalcification making the hole larger. As the cavity grows, it can cause pain and it may cause the pulp to die. A cavity has to be repaired by a dentist before it gets too large and the tooth has to be extracted. Primary or baby teeth have very thin enamel and cavities grow deep quickly. Whereas, with the permanent teeth, the enamel is very thick and a cavity grows slowly. If you think you have a cavity forming, see your dentist quickly for restoration. Seeing your dentist in a timely manner may prevent tooth loss and cost less. What can be done to prevent white spots from developing? Very simple, brush your teeth. Keep the plaque to a minimum. Dig with the bristles of your brush underneath the wire. The plaque will accumulate mainly between the wire and the gums and underneath the wires. Be aggressive. Do a good inspection after you brush. Look at your teeth. If you see anything on your teeth, it is either plaque or food. Take your toothbrush that you just used and remove it. Besides using a regular toothbrush, you can also use an electrical tooth brush like an Oral B or Sonicare toothbrush. Electric toothbrushes work very well in reducing plaque and are better than a waterpik. Waterpiks are not good at removing plaque as well as an electric toothbrush. Also waterpiks can push bacteria into the gum tissue if you have gum disease. Don’t use waterpiks to clean your teeth and braces. What can be done about the white spots? Ask your orthodontist for a prescription for GC MI Paste. GC MI Paste is a specially formulated paste that remineralizes the enamel. It replenishes the calcium and phosphate lost during acid production by the plaque. Watch the video. Another item that can be prescribed from your orthodontist or family dentist is Colgate’s PreviDent 5000 Plus (Rx only) or Colgate PreviDent 5000 Sensitive (Rx only) tooth paste. Both deliver 5000 ppm of fluoride in a professional strength 1.1% Sodium Fluoride paste. Directions state they you should brush once a day, preferable before bed, for two minutes. In three to six months, caries remineralized by 57% in most patients. These products are not recommended for children under 6 years old. After the CG MI paste is used for a period of time, and there are still some white spots, an infiltrating resin like DMG ICON can be applied by your family dentist or orthodontist to reduce the appearance of the white spots. This procedure takes just one office visit. After the teeth are cleaned, they are prepared for the resin. The resin infiltrates the enamel and changes the color of the white spot to a more tooth colored enamel. ICON may not completely get rid of all the white spots but it does accomplish a better appearance. So it’s up to you. If you keep your teeth free from plaque, the chances of a white spot developing will be very minimal. 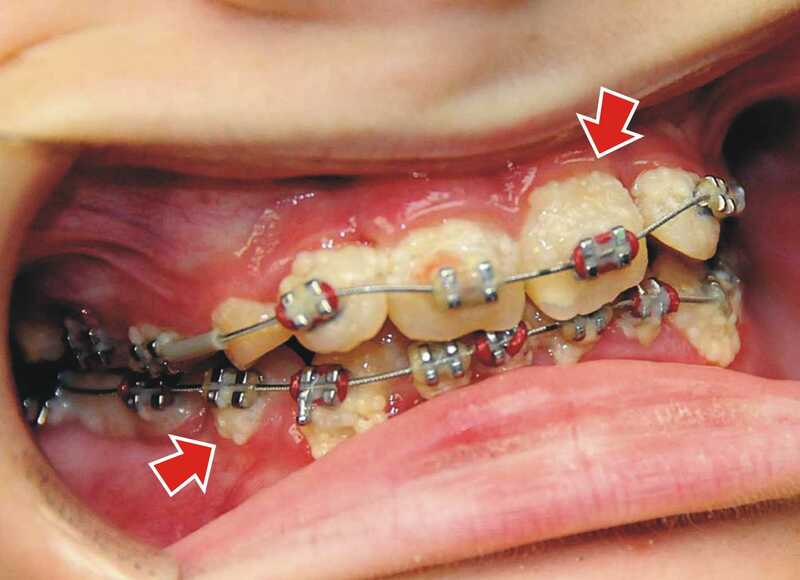 ← Previous Previous post: What do the Elastic Rubber Bands on Braces do? Next → Next post: My Wire Came Loose and is Poking, What Do I Do?